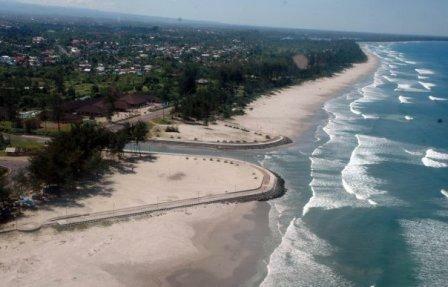 LONG BEACH is a coastal province BENGKULU. Called LONG because the elongated shape, with a gently sloping sand. LONG BEACH is located in sumatra island, so most of the shoreline facing west, which meant SUNSET beautiful panorama can be enjoyed along the coastline. Named LONG BEACH because the length of this beach is 7 kilometers and became the longest tourism sloping beach in Indonesia. LONG BEACH is located three kilometers from the city of Bengkulu, part of sumatera island, Indonesia. With white sand, pine trees that shade and big waves, LONG BEACH offer stunning sea tourism. With big waves, LONG BEACH will become a paradise for surfers, the best to surf early in the morning until mid day.Since LONG BEACH has the strong current, it is dangerous for swimming. With exoticism and natural beauty, LONG BEACH could be the best location for tourists to enjoy sunbathing, morning or afternoon jogging, photo sessions pre-wedding, making film or capturing the happy moments with your partner, friends and family. To reach long beach is very easy. Only 55 minutes from the capital city of Indonesia, Jakarta. By the time you get to the airport of Fatmawati, Bengkulu, public transportation or taxi available. cottages, inn, parking area and swimming pool is available along the LONG BEACH.